What options should you add to your heavy duty casters? - There are several options that you need to consider when ordering your heavy duty casters. What options should you add to your heavy duty casters? There are several options that you need to consider when ordering your heavy duty casters. There are several options that you need to consider when ordering your heavy duty casters. Just looking at the weight and spec design is not going to be enough to make sure that you have what you really need. The biggest mistake that companies make is not looking towards the options available for their heavy duty casters as a way to help mitigate risk throughout their operations. Here is an overview of what options are most important for you to consider before placing your next order for heavy duty casters. What applications require heavy duty casters? Heavy duty casters can be typically found in any situation in which heavy parts and items are transported. They are in use in automotive, aviation, marine and other heavy equipment based industries. They can also be used in lighter duty applications that have transport paths that are stressful to the trolley too. The heavier the application - whether in load weight or transport style - the more you need to pay close attention to the types of brakes and hardening treatments you order with your heavy duty casters. Not all heavy loads will require maximum safety and security options, but if you have a confluence of factors such as path, weight and speed raising your risk - you need to be proactive in choosing options that mitigate injury to workers and to the load carried. Toe guards should be a must when it comes to installing heavy duty casters. The chance of injury involved with the trolleys under load can be more than halved with this style of guard. Braking options are kept out of the way of the guard so there is no chance that toeing the brake can cause the foot to become stuck. There are two main brake styles available for heavy duty casters. The first is the poly lock cam style and the other is the swivel lock. The cam style places the braking surface flush to the face of the wheel and is installed in the factory. It provides you with a maximum braking surface that can help control heavy loads. The swivel lock is field installed. It provides you with sure braking control that is toe controlled. There are several other options that may be a good fit for your heavy duty casters. One of them is to have the raceways heat treated. This can increase their strength and resistance to wear. If you are using your trolley in areas with rough surfaces and transporting full loads, this could save you from having to replace your casters frequently. One last consideration is whether or not you should have custom heavy duty casters made. 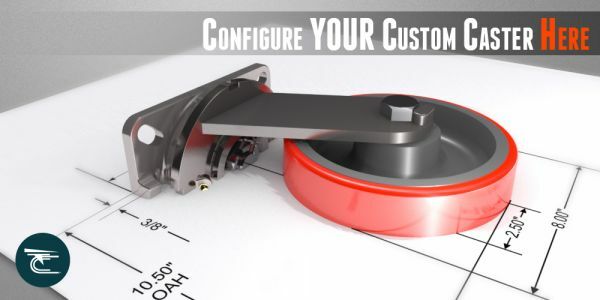 If you aren’t seeing exactly what you need to do the job in the catalog listing, use the CasterConcepts’ online designer to create what you need to exactly your specifications? For More Info about Heavy duty casters Visit Us. If you want to get the most out of your heavy duty casters then you have to learn what to look for when sizing your casters for purchase. Picking out heavy duty casters shouldn't be done on weight class alone. There are manufacturing standards that should be followed to make sure that the caster can really survive the use and abuse it. Think that any weight of caster can do the job for you? Think again, medium duty casters are designed to deliver speed and control for a specific load range that others can't. There are many innovations in polyurethane wheels that have begun to change the role they play in engineered applications. Industrial cart wheels deserve your attention. Polyurethane wheels are the base standard for trolleys, but they are experiencing resurgence in popularity – for good reason.